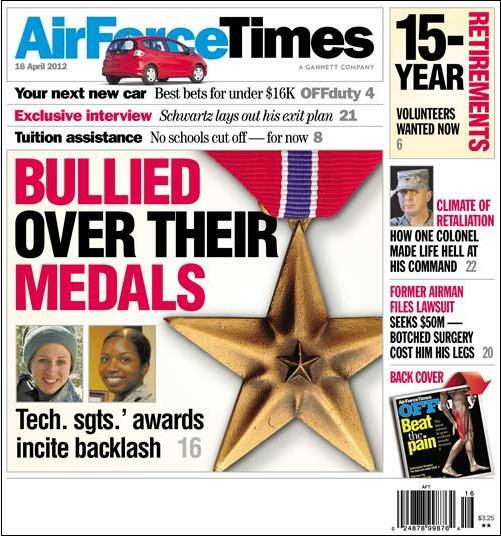 Two female airmen have come under fierce and personal criticism online after the Air Force posted stories on their being awarded the Bronze Star for meritorious service in Afghanistan. Many of the people leaving comments said the airmen didn’t deserve the award, prompting the Air Force to take one of the stories offline because, “No one deserves that level of criticism for meritorious service in a combat zone,” said David Smith, a spokesman for Air Education and Training Command. By far, most of the Bronze Stars awarded by the Air Force and Army are for meritorious service, not combat valor. “I certainly wouldn’t want to go back to any of these half a million Vietnam War veterans who got meritorious Bronze Stars and start questioning them,” he said. Also, Mary Ellen Spera is one of the whistle-blowers whom the Air Force retaliated against for letting investigators know about the mistreatment of fallen troops’ remains at the Dover Air Force Base port mortuary. An Office of Special Counsel investigation vindicated her and the other whistle-blowers, but Spera still has one nagging thought.